Psst… Get 40% off your Ann Taylor purchase now! 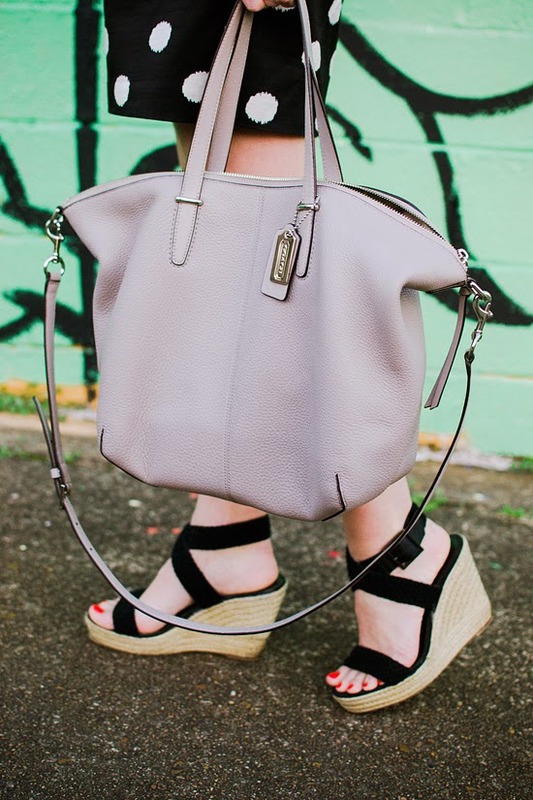 I have found the Spring bag of my dreams - soft leather, my favorite neutral (warm gray), slouchy shape, & all the pockets I need + more. If you are looking for your Spring bag, be sure to come visit me this Thursday at the Green Hills Mall Dillard's! 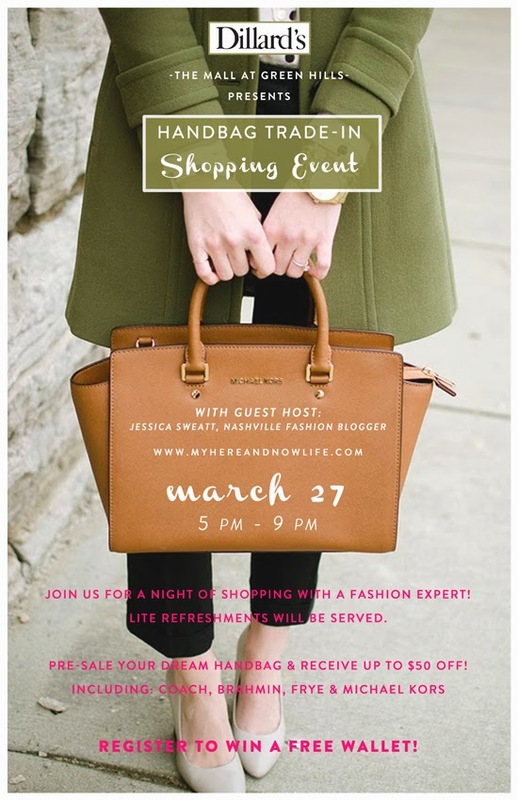 From 5 - 9 pm I will be hanging out in the handbag department, talking about Spring trends, & helping you pick out your next dream bag. Even better, it's time for Dillard's Handbag Trade-In Event. Bring a bag to donate & get up to $50 off your next purchase (which I will help you find!!). All donated bags will be given to Operation Stand Down, a local military charity. This organization centers their mission around assisting former vets & their families. The donated bags will go to female vets who have been given housing in the Nashville area, & need the adequate interview + lifestyle materials. OMG this outfit it too cute! 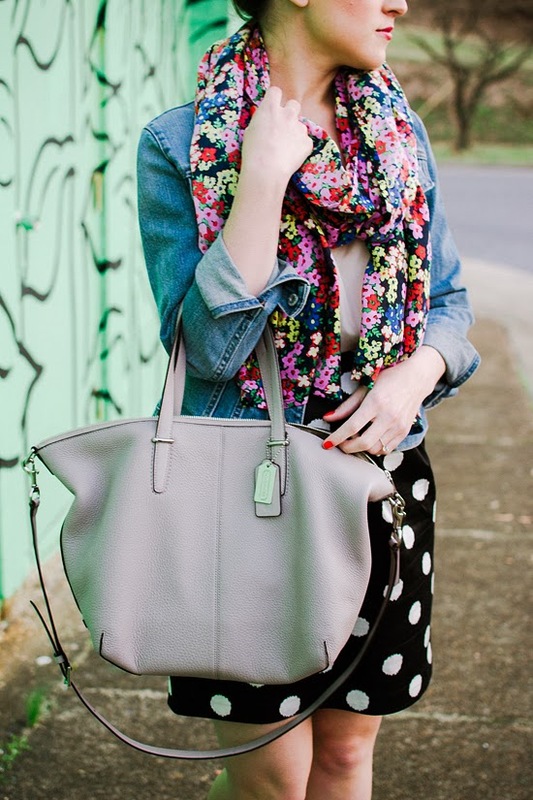 The scarf is an amazing print and paired with your polka dot skirt and adorable wedges!!! LOVE! I love the mixed prints with polka dot & floral. It's gorgeous and you are rocking it! 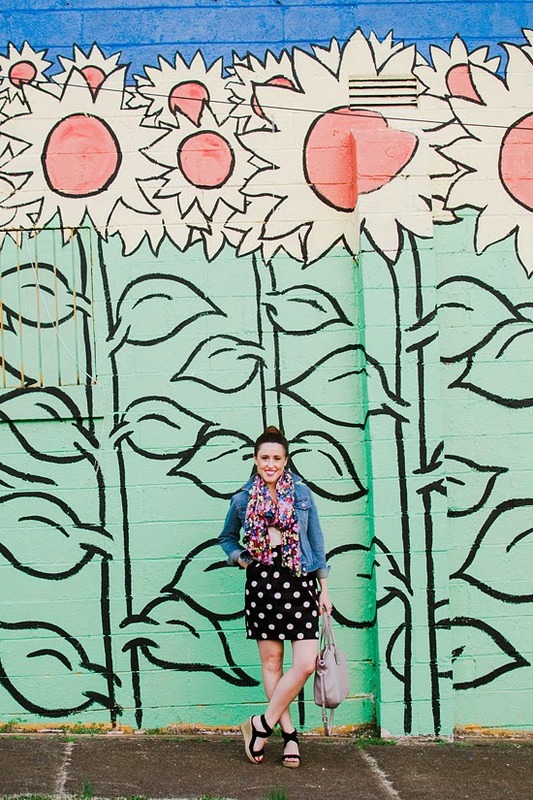 What a fun mural to take picture in front of. Some how that polka dot skirt goes perfectly! You have the best photo backdrops- seriously! Love your dots and floral combo! What a fun mix of floral print and polka dots...super cute! Your scarf and skirt are perfect! I love the pattern mixing in this look! 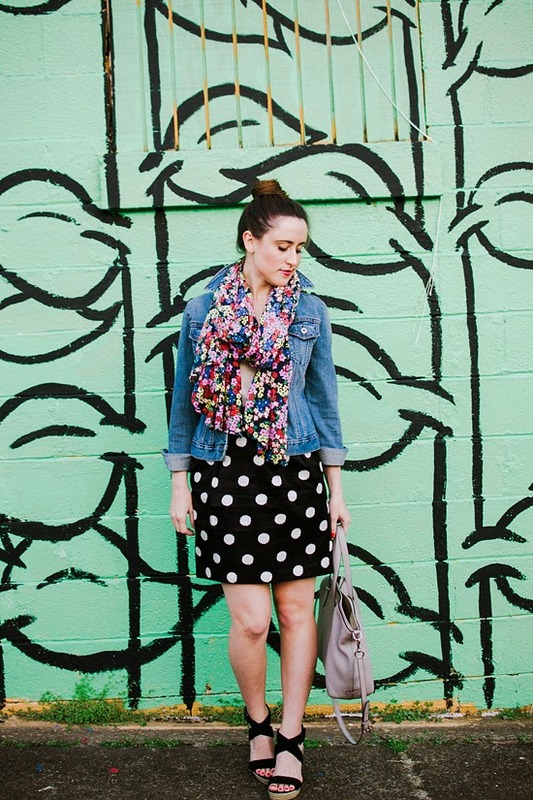 The bold dots in your skirt are awesome! Love it! Especially love the Target wedges!!! Is that backdrop here in Nashville? This scarf is PERFECT! I want! Also loving those wedges. What a fun event for Dillard's, and it's such a great cause, too! This is so adorable, I love the floral and oversized polka dots. Gorgeous outfit..and I love this wall! Oh my gosh me too, I am happy to see them getting back to their roots: really awesome, buttery soft leather goods! 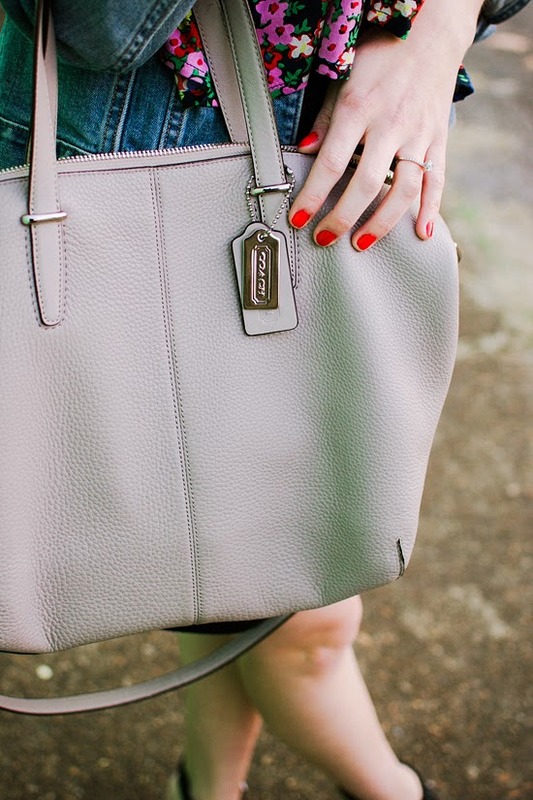 The Coach Spring collection is officially drool worthy! haha, sometimes Zipporah really comes through for me when I have put things off to the last minute :) And I could never hate you, these sunflowers were made for sharing!! you look totally cute! 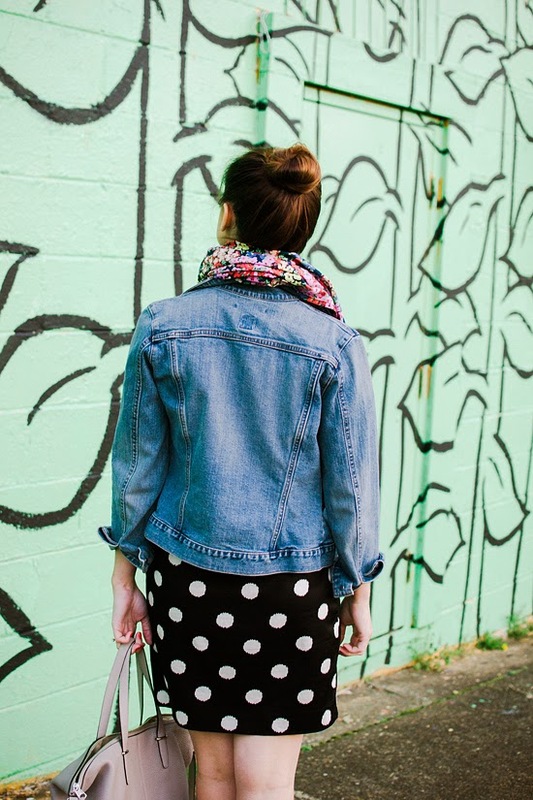 love your polkadots skirt and the jacket! First off, that wall of sunflowers is amazing! :) So pretty! Your outfit is cute, too, and that sounds like a great event you get to be involved in! How cute are you. Adore this look! GIRL! What a perfect spot for photos! Kansas City has a few places that are cool like that but they are more naturey and look dead right now! Love the outfit too Jess! Hope the event went well! 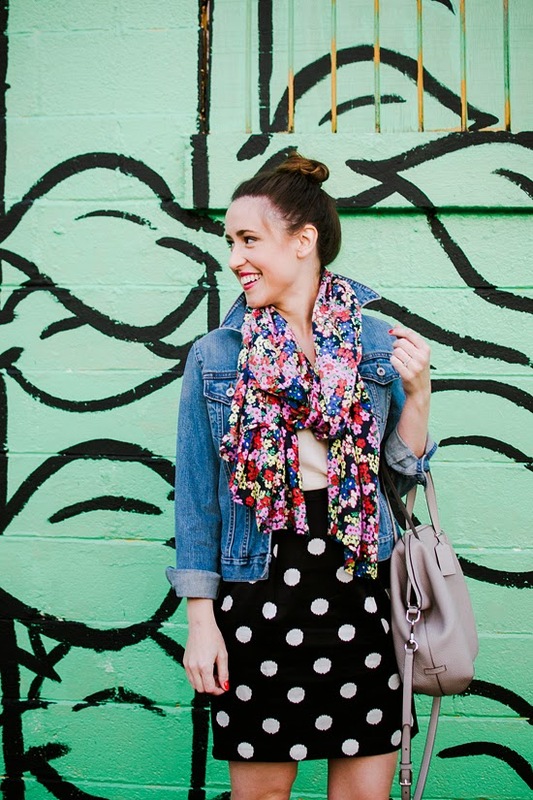 Your floral and polka dot combo is great for spring.